Guiding us from Joaquin Miller Park to the Gaza Strip and introducing us to witches and onion-sniffing death machines along the way, Tuck explores these themes — and many others — in her new chapbook, Terror Matrix, which will be released on Friday, May 9 at Oakland’s newly opened E.M. Wolfman’s General Interest Bookstore (13th Street and Broadway). The chapbook was published by Timeless, Infinite Light — a small press dedicated to publishing local, contemporary poetry. Tuck found Timeless, Infinite Light through what she described as a “thriving East Bay literary scene.” In fact, Tuck moved to the Bay Area six years ago precisely because of the area’s rich history of literary excellence and concordant activism. “Oakland has a proud activist tradition of writers,” she said. The founders of Timeless, Infinite Light were attracted to the area for similar reasons. Unsatisfied with the literary scenes in Olympia, Washington and New York City, the group of young writers finally settled in Oakland. “It’s weird poets, like Zoe Tuck, that were the draw for us here,” said Otis Pig, Timeless, Infinite Light’s co-founder. 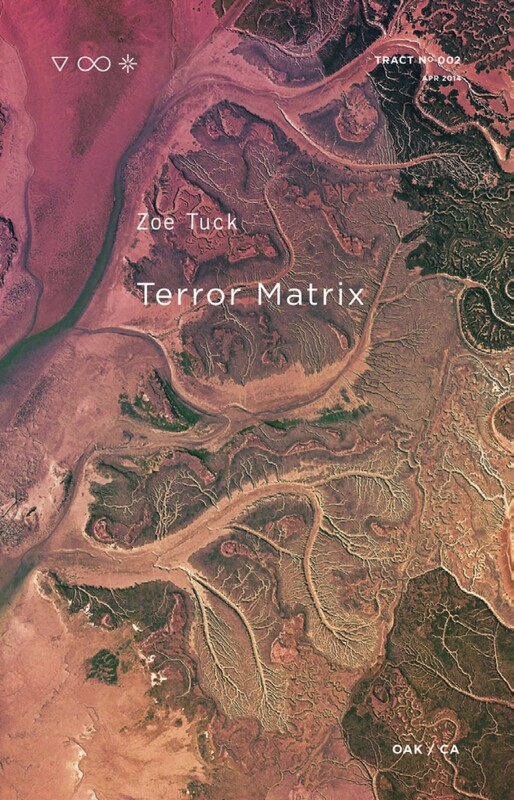 Tuck will read from Terror Matrix today at 7 p.m. The event is free. Copies of Terror Matrix ($15) will be available for purchase.